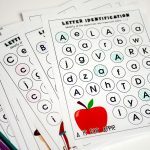 These Alphabet Letter Identification Printables are such a fun way for preschoolers to learn their letters! Just download, print and start the learning fun! 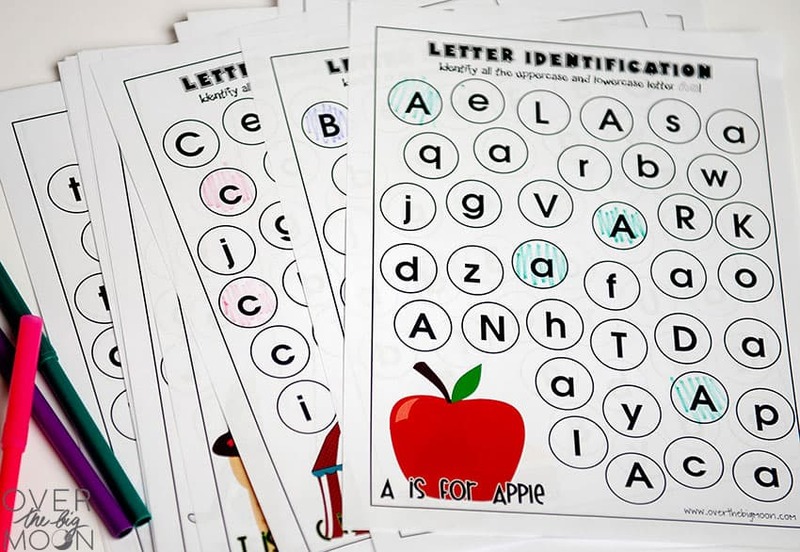 Today I’m sharing this set of Full Alphabet Letter Identification Worksheets with you guys! 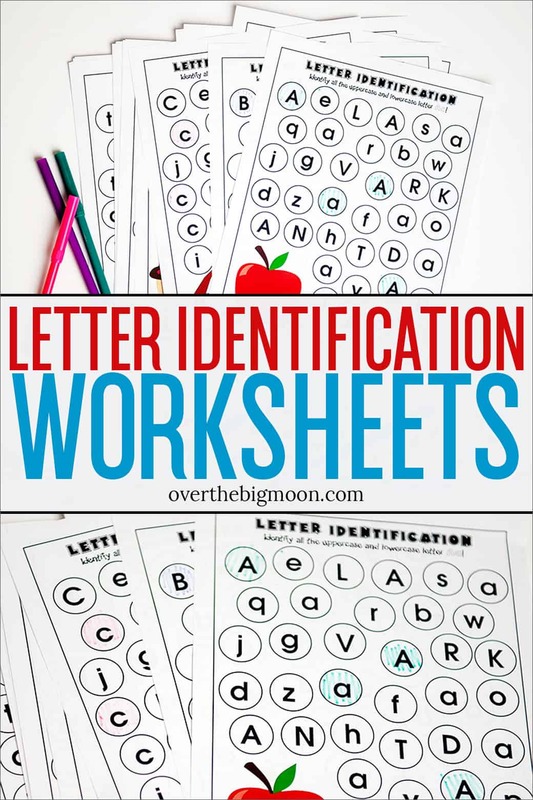 This idea actually came in from a reader via an email and when I read her email I thought to myself, “Duh, why haven’t I done that?” My boys absolutely love the Letter Identification page out of my Pre-K Packs and so some days when they just need a short activity this will be a great go-to printable to have on hand! 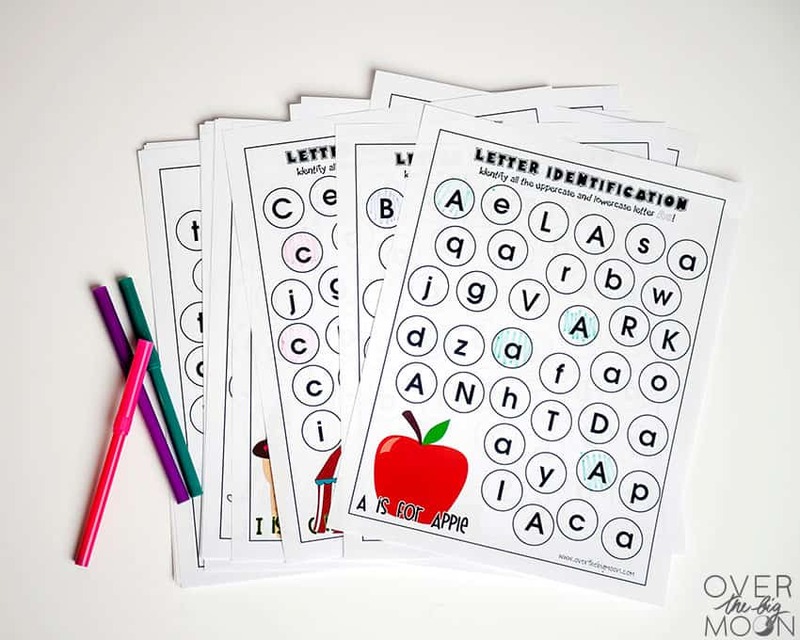 There are two ways to put your Alphabet Printables together. You can have them be for one-time use or reusable! ONE TIME USE: In this case, all you need to do is download and print them. My kids LOVE using their Do-A-Dot Markers on these worksheets when they’re once time use. They’re kind of like Bingo Markers! That way they just ‘dot’ the correct letters and are done! REUSABLE: There are a few ways to make them reusable! My preference is laminate them. Then you can use Dry Erase Markers or Crayons to mark the correct letters. When they’re done, you can just clean them off and they’re ready to be used again. If you don’t have a laminator, then you can put them in a page protector or use them on the Crayola Dry Erase Activity Center and do the same thing. I do suggest you print them on cardstock to make them sturdier! I’ve also got these fun learning printables! 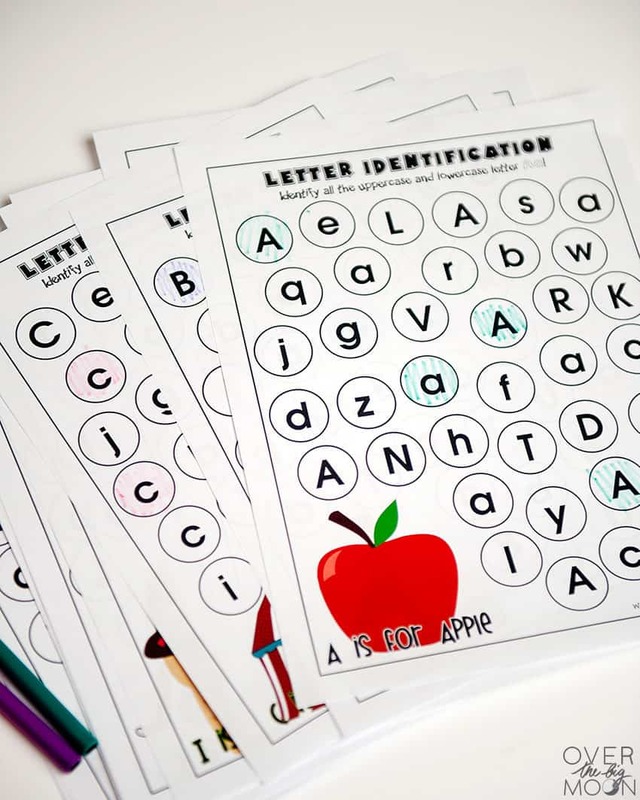 To download the Letter Identification Printables, just click the button below! Hope your kiddos enjoy this one – I think it’s a great learning printable, but also super fun! Have a great day! *This post was originally published in March of 2013 and has been updated! Don’t forget to pin the button below! Do you do any stuff in Spanish? I teach Kinder but it’s all in Spanish. Thank you so much!! These will be great for my kindergartner! Thank you, this is AWESOME! I can’t wait to get these printed and put into use! Thank you so much for this generous freebie! I actually would have gladly bought it! Can hardly wait to print and use it! this is really nice.. thanks for sharing! This is so awesome! Thanks so much for sharing. Thank you, thank you!!! These are GREAT! Thanks! These will come in handy! YAY!!! We LOVE these too! Thank you so much. We often put them in sheet protectors and either use garage sale stickers (the colored, circle ones) or holiday themed ones (recently – we had lots of hearts for Valetine’s Day). Thanks again!! !